Is sugar always bad? Not necessarily. Many healthy foods contain naturally-occurring sugar, including fruits, some vegetables, milk, and whole-grain foods. Sugar is recognized by the FDA as a nutrient. The problems start when you consider how much sugar is found in the average Western diet. When you eat too much added sugar (and most Americans do), it becomes difficult to include enough fiber, vitamins, and other essential nutrients to your diet while retaining a healthy weight. If you look at the nutrition labels of your favorite foods, you can find how many grams of sugar are lie within. But currently you cannot tell whether that sugar comes from a natural source such as dried fruit, or if it has been sneaked in with the rest of the ingredients later. This will change in 2020 when new nutrition labels will be required, but for now, you have to read the ingredients list carefully. In general, you should choose foods that have added sugar sources like cane sugar, honey, dextrose, and high fructose corn syrup low on the ingredient list. 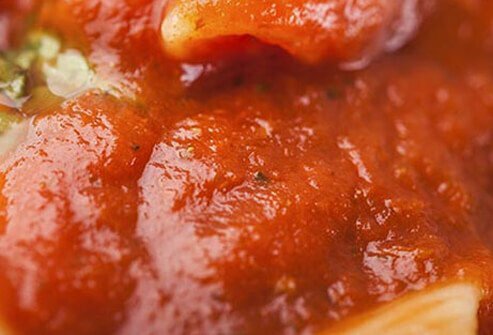 Depending on the brand, store-bought pasta sauce could pack 2-3 teaspoons of sugar into a half-cup serving. Manufacturers do this to make unripe or out-of-season tomatoes more palatable, and to preserve the shelf-life of their products. Make it yourself. By choosing tomatoes that are ripe and in-season, you can enjoy their natural sweetness without adding sugar. If you’re short on time, buy premade spaghetti sauce advertised as having no added sugar. But be careful—some products that advertise “no added sugar” add other sugary-sweet ingredients like fruit juice instead. Always check the nutrition label. Granola bars look healthy. 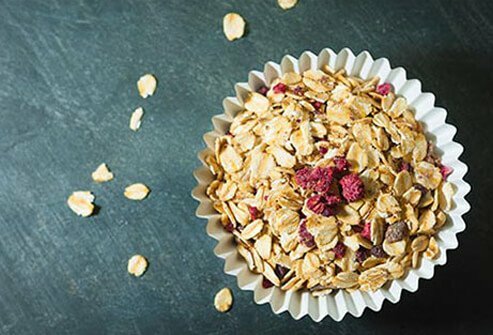 They often have oats, nuts, and other healthy ingredients. But they also typically come with 3-4 teaspoons of added sugar. The nutrients usually don’t make all that extra sweetness balance out. 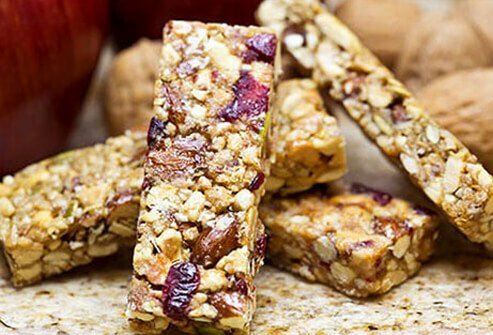 Some granola bars are healthier than others. Avoid the ones with ingredients like fructose, dextrose, honey, corn syrup, and brown sugar syrup. These are just fancy words that describe the same thing—sugar. Look for bars with fewer than 8 grams of sugar according to the nutrition label. 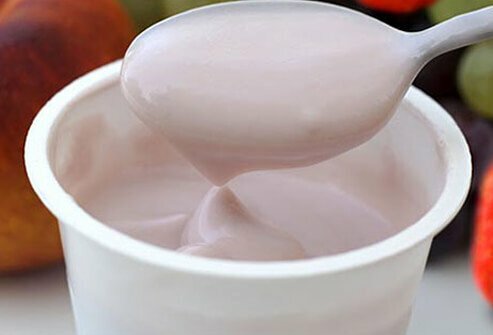 Yogurt is milk fermented with healthy bacteria. It’s probiotic and full of calcium, all of which makes it healthy. What’s not healthy, though, is all the sugar that gets poured into the flavored varieties. In a standard 6-ounce container of Yoplait cherry yogurt, for example, you will find 4.5 teaspoons of added sugar. And it’s no wonder; sugar is the second ingredient listed on the label. Skip the flavored varieties and learn to enjoy the tart taste of plain yogurt. Add your own blueberries, banana slices, or other favorite fruit. You can even add some sugar or honey yourself—if it’s less than 4.5 teaspoons, you’re doing better than the store brand. The oats found in oatmeal are quite healthy. They provide potassium and iron, as well as fiber. However the flavored, instant varieties usually pack in a fair amount of added sugar—about 3 teaspoons worth. You probably eat instant oatmeal either because it’s oatmeal, or because it’s sweet. If you love oatmeal, make yourself some stovetop oatmeal. It only takes 5 minutes. If you want instant breakfast, try a piece of fruit for a healthier source of sweetness in the morning. 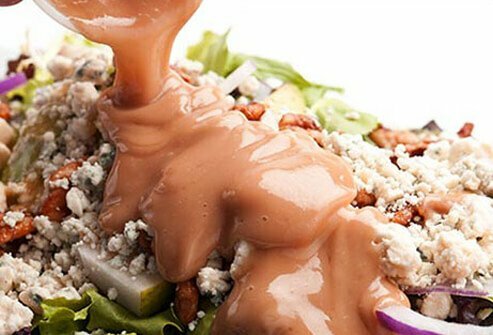 The salad underneath is healthy, but what about the dressing you put on top? A serving of Kraft Thousand Island adds a teaspoon of sugar to your salad, and that’s assuming you’re satisfied with 2 tablespoons of dressing. You can enjoy the zesty flavor of dressing without added sugar by making it at home. Preparing an olive oil vinaigrette takes very little time. Plus you know each ingredient is high-quality because you chose it yourself. Everyone knows children’s breakfast cereals are sugary, but even the adult varieties are often weighed down with added sugar. Honey Bunches of Oats, for instance, has 3 teaspoons of sugar in every cup. Choose a cereal with a high fiber count. One cup of shredded wheat serves up 6 grams of fiber and less than half a gram of sugar. When in doubt, read the box. You drink them for a quick pick-me-up, but energy drinks can also send you into a serious sugar slump. 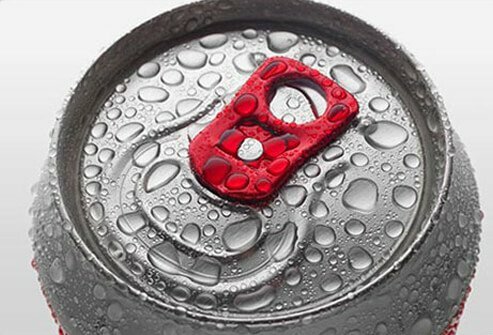 One survey found that the average 8-ounce energy drink contains 6 teaspoons of sugar. There are even some cans that serve a whopping 27 teaspoons of sugar—more than half a cup! If you want a jolt of energy without the added sugar, try unsweetened tea or coffee. Or if you like the taste of energy drinks, stick with the sugar-free varieties. Fruit, obviously. But to preserve that fruit, foodmakers add lots of syrup or other sugars. 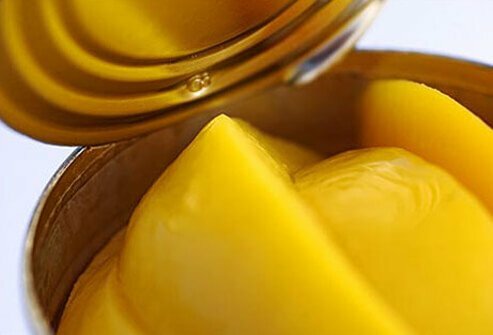 One cup of canned peaches more than 6 teaspoons of added sugar. A 4-ounce cup of Dole sliced apples in 100% fruit juice may sound healthy, but is 4.5 teaspoons of extra sugar a healthy way to eat apples? Clearly not. Fruit that isn’t prepackaged is usually healthier. Any fresh fruit is a better alternative to sugar-laden fruits from a can or blister package. 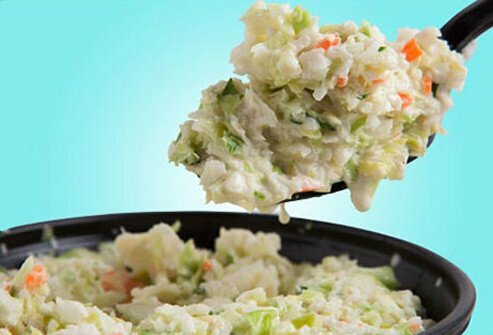 It’s full of cabbage and carrots, but coleslaw also comes with plenty of sugar. 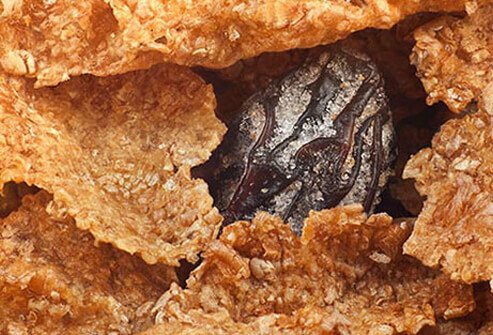 A cup of Kentucky Fried Chicken coleslaw serves up about 4 grams of fiber and lots of vitamin C, but also contains about 6.5 teaspoons of sugar. Healthy side dishes can be hard to come by. Instead of coleslaw, order a salad with dressing on the side, fresh fruit, or steamed veggies. Other than water, tea is the most widely consumed beverage in the world. Although it comes in several varieties, all tea comes from the camellia plant. In its natural state, tea has no sugar. However that’s not often how it’s sold in stores. For example, a bottle of Arizona Green Tea has nearly 12 teaspoons of sugar. Even if you add sugar to your home-brewed tea, you can control how much. You may even find that you like the taste without any sweetener. If you really want a sweet beverage, look for sugar-free options. Some may be sweetened, some may not, but as long as you’re checking the nutrition label you should be able to find a healthy option that tastes great to you. 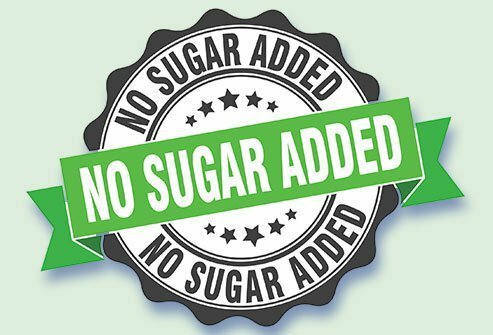 Even if they don’t add extra sugar, there are ways for food manufacturers to add plenty of the sweet stuff to your “no sugar added” options. To be labeled “no sugar added,” a product can’t have refined sugar, corn syrup, syrups, or honey added. There’s a big loophole though. 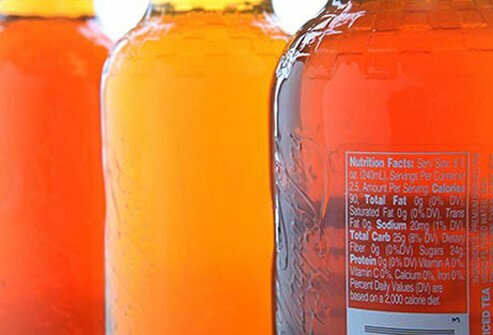 Food companies can add certain forms of fruit juice, and these can be very sugary. Be skeptical of the “no sugar added” label. Sometimes it will lead you to healthier options, but not necessarily. Always check the ingredients list on the back of the container, and in particular, scan for fruit juice sources from “no sugar added” products. Do you eat fries with a side of ketchup, or is it the other way around? A little ketchup in moderation won’t hike your added sugar percentage up by much, but that all depends on how much you use. 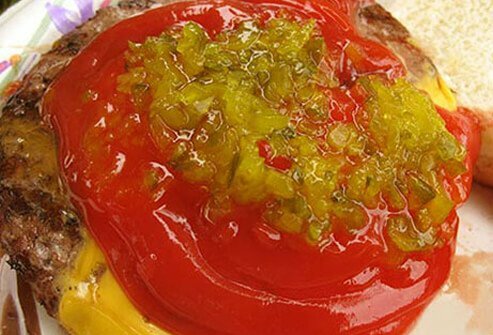 Ketchup is about 1/3 sugar, so a tablespoon comes with a teaspoon worth of sugar. 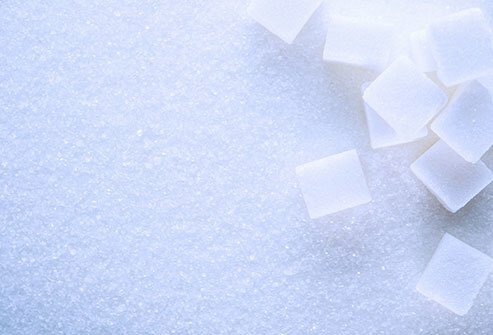 There are a few low-sugar options out there, but they can be hard to find depending on where you live. If you can find one of these, go for it. If not, and if you know you tend to slather ketchup on your food in a big way, consider switching condiments. Yellow mustard, for instance, has little or no added sugar. 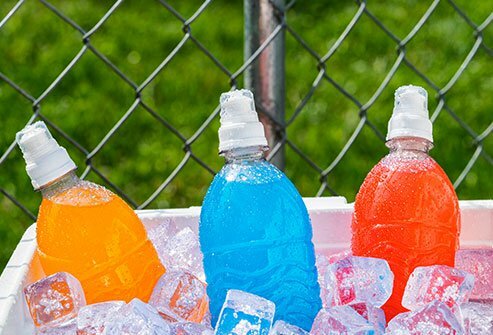 Sports drinks like Gatorade and Powerade sell themselves as thirst-quenchers that perform better than plain water. While it’s true that they provide some of the salts your body sweats out during a workout, they also include lots and lots of sugar. A standard 20-ounce bottle of lemon-lime Gatorade has 7 teaspoons of sugar, making it one of the most sugary substances on this list. If you work out to maintain a healthy weight, you’re undoing a lot of the healthy benefits of exercise with all those unnecessary calories. Pure, simple, unadulterated water is better for your health than sugar-saturated sports drinks. If you’re worried about missing out on the highly-touted electrolytes sports drinks provide, you can do much better without the added sugar by eating a banana or making a post-workout spinach smoothie. Anytime you drink alcohol, you’re drinking the byproduct of sugar. Alcohol is made from fermented sugars. Some drinks still have sugar after the fermentation process ends, and others have sugar added later. Some alcoholic beverages are sweeter than others, though. Just a little over 2 ounces of TGI Friday’s Mudslide Mix has a whopping 5.5 teaspoons of sugar! You can expect similar levels in other sweet cocktail mixers. Standard domestic beer has little or no sugar. Most hard alcohol, including tequila, brandy, and whiskey, don’t have any added sugar. Wine is a little more complicated and varies from type to type. Even so, it’s hard to find a wine that comes anywhere near the sugar content in a standard cocktail. 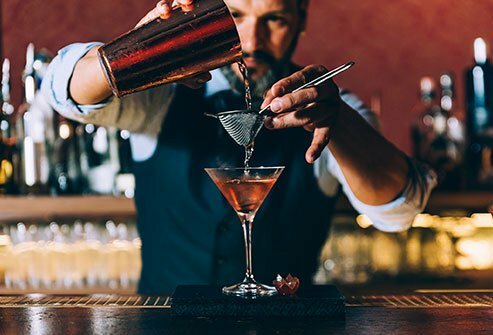 Of course the best option for your health is to cut alcohol out entirely—every calorie from an alcoholic beverage is an empty calorie. It depends on the fruit juice. Very dry fruit juices like 100% cranberry juice have less than half a gram of sugar in a cup. This type of juice is extremely tart, and many will find it difficult to drink straight. On the other end of the spectrum, a cup of pure apple juice contains 6 teaspoons of sugar. Orange and grape juices are similarly sugar-sweet. 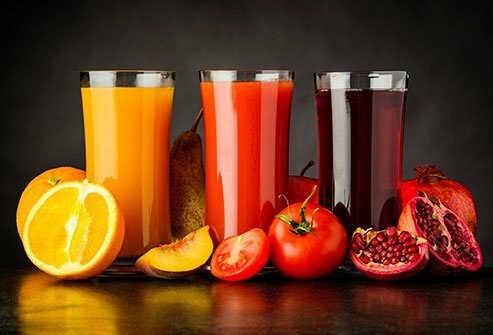 If you love fruit juice, enjoy it in moderation. When you drink a sugary fruit juice, consider it a dessert, not a fruit supplement. If you’re trying to lose weight and find yourself drinking lots of fruit juice, you may want to avoid it entirely—the health benefits don’t outweigh all that extra sugar. Fruit gets its sweet taste from sugar, and dried fruit is no exception. The big difference is how much sugar dried fruit contains pound-for-pound. 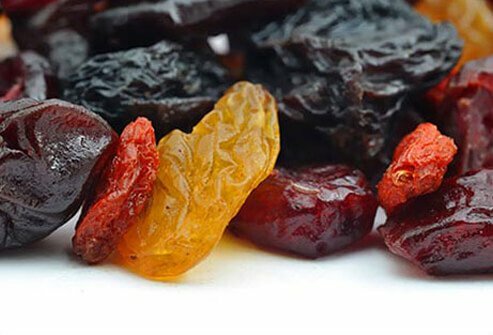 Drying the water out of raisins, prunes, and other dried fruits also shrinks the total volume of the fruit. You can eat it in a healthy way, but you need to eat a lot less dried fruit to add up to one serving. Take grapes for example. A serving size of fresh grapes is 1 cup. Their dried counterparts, raisins, give you a serving from just 1.5 ounces. Dried fruit can quickly sneak up on you and wreck your diet because it’s easier to overeat than fresh fruit. You can enjoy either a cup of grapes or an ounce and a half of raisins and get the same nutritional value. Which would you choose? 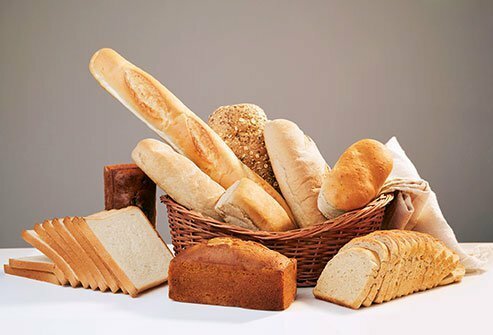 Depending on the type, bread can be a healthy part of your diet in moderation. Whole grain varieties offer lots of health benefits, including fiber. But if your mission is to avoid added sugars, watch out for bread. Even healthier breads often contain a fair amount of sugar. The otherwise healthy Milton’s multi-grain, for example, has a little over a teaspoon of sugar in every slice. There are a few sugar-free breads available if you search for them. Rye bread tends to be lower in sugar, as does pumpernickel. It varies widely by brand and type, though, so you will need to use your detective skills by reading the nutritional facts before you buy. On the ingredient labels of many popular canned soups, you don’t have to read far to find sugar. For example, the second ingredient of Campbell’s tomato soup is high fructose corn syrup. That soup has 3 teaspoons of sugar in every half-cup. While many soups do contain added sugar, many more do not. 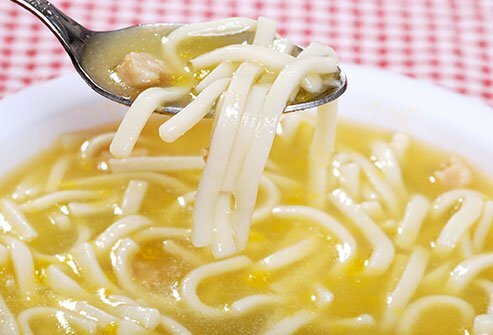 Chicken noodle, cream of mushroom, and ramen-style soups often have no added sugar. You should choose these types when avoiding sugar, but be careful—the sodium content in some of these foods can harm your health as well. Of course you can avoid both sodium and added sugar by making soup at home. If you’re strapped for time, make some on the weekend and freeze what’s left over for later in the week. Do you take fiber supplements? How about chewable vitamin C tablets or gummy vitamins? Many of them contain some form of sugar, be it corn syrup, grape juice concentrate, or corn starch—which is not technically sugar, but breaks down into sugar as you digest it. That’s especially true of children’s multivitamins, which are made sweet to encourage kids to take them. 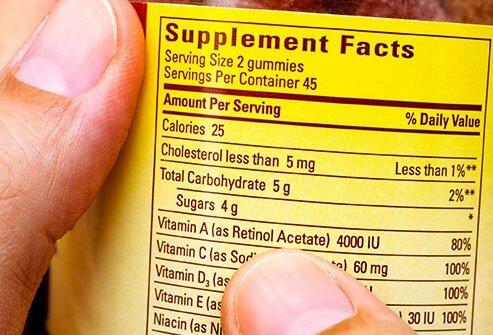 Don’t assume that all vitamins and supplements are entirely healthy. With a little sleuthing, you will learn from the label whether or not your nutritional health is being preserved by your choices. If you find more than you bargained for on the label, don’t be afraid to switch brands or types; for instance, choosing pills you swallow over those you chew up. The standard smoothie has bananas and other fruits blended up with ice—no added sugar required. 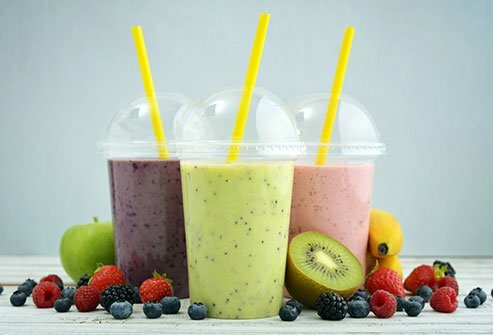 However many smoothie-makers go beyond the basics, loading these drinks with protein, vitamins, and often ice cream, frozen yogurt, honey, and other sweets. That can include fruit juice, too, which can also turn your smoothie into a sugar bomb. Without all the added sweets, a smoothie can be a healthy choice. The trick once again is to buy carefully. Whether the smoothie is bottled or made fresh, find out what’s actually inside it. If you buy from the store, read the ingredient list carefully. If your smoothie is freshly made, ask enough questions to know whether you’re picking a healthy option. 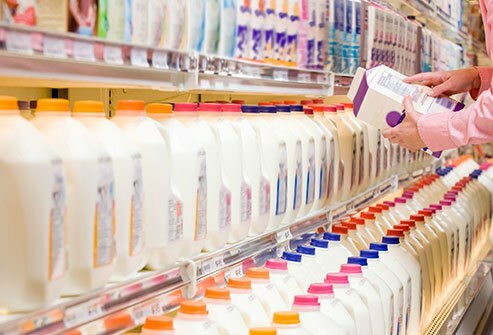 Dairy aisles have exploded with milk alternatives. Soybeans, cashews, rice, hemp, and even peas have been turned into milk alternatives. Some of these have healthful benefits, but beware: many also add sugar to your creamy beverage. That’s a particular danger when choosing soy milk, pea milk, and rice milk. When your milk alternative tastes sweet, there’s a reason. Very sweet milk alternatives often have sugar, so check the label and do your research, especially if you’ve chosen a flavored variety. You can still enjoy milk alternatives guilt-free, but of course classic cow’s milk is a reasonable alternative that doesn’t come with added sugar.